This is how you make asphalt paving companies uncomfortable, tell him that you need him to sealcoat your parking lot at night. On the one hand, he, like most other asphalt professionals, is accustomed to adapting his schedule to make things more convenient for his customers. On the other hand, he knows that in three to six months, you will very likely be calling to complain that your sealcoating is already worn out. It does not matter how experienced your contractor might be — although nighttime sealcoating is certainly no job for a rookie — his chances of giving you the quality of work to which he is committed are greatly reduced if he is forced to apply sealcoating at night. Sealcoating At Night – A Good Idea? • Sealcoating is formulated so that the sun’s rays do much of the curing. It is not just the heat of the sun, either; it is the UV rays that do most of the work. Therefore, if you are thinking that you can have your area sealcoated at night and open to traffic when the sun comes up, you need to reconsider. Without the curing process provided by the sun, your sealcoating will be destroyed as soon as you allow cars to drive onto your parking lot. • Sealcoating applied at night tends to be much softer than sealants applied during the day. Softer sealcoating means shorter life — often a third of the life of a comparable job performed during daylight hours. • Conditions have to be ideal for there to be any chance of success for a nighttime application of sealcoating. Overnight temperatures cannot drop below 50 degrees Fahrenheit. Humidity levels need to be low, but there needs to be a nice, steady breeze. Instead of having your parking lot sealcoating applied at night, ask your contractor about other ways to minimize the disruption that a closing can have. For example, perhaps the area could be sealcoated in sections so that the entire lot did not need to be closed at the same time. Your contractor will probably be willing to do the work when your business is closed, such as on a holiday or over a weekend. 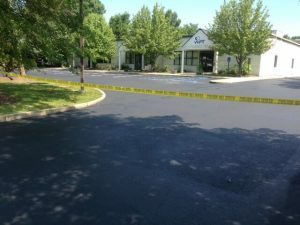 Asphalt Pavement Solutions has more than 30 years of asphalt paving services with sealcoating, asphalt paving and asphalt crack repair, parking lot striping and the installation of bollards and car stops. We offer our services to customers throughout New Jersey, Delaware and Pennsylvania. Our crews are committed to providing all of our clients with high quality work at reasonable rates. If you would like to request a free quote, you can call (856) 461-1710 or our toll-free number, (800) 559-SEAL. If you prefer, you can send us your information by submitting our convenient online form.